If you just as me is eating according to the keto diet you probably already know that your main source of energy should come from fat. Sometimes it can be hard to find good easy snacks that contain a very high percentage of fat. The solution however is to make “fat bombs” that you can use whenever you feel for a little snack. There are many different recipes that describe how to make fat bombs. I recommend you to simply try out one or two of the recipes below and see which ones that suit you the best. I personally am allergic against nuts, almonds and peanut butter so I have not been able to try the recipes that contain this myself. Take the above ingredients and stir them together. Put them into small muffin holders or other thing and put into the freezer for around 30min. Can be kept in the freezer if needed. Whole batch ends up at 91% fat, 4% protein and 5% carbs. Based on the above recipe for fat bombs I have created some recipes on my own that you are free to try out. Personally I do not like to have additional sweeteners included so I always try to remove the Stevia and instead add 85% chocolate. You can mix around a little with the sizes of the different ingredients to get the one best for your taste. If you need something more sweet you can add on additional Stevia. In order to make your fat bombs you should first soften the butter, almond butter or coconut butter (according to recipe). Make sure the butter is soft and easy to handle. Make sure you do not completely melt it. Also melt the chocolate so you can handle it in a good way. Mix butter, chocolate and the other ingredients together into a nice mix. After you have thoroughly mixed together all the ingredients take out some kind of form. It is preferred to have a non-sticky form like a silicone form or similar. Add the mix for the chocolate bombs into the non-sticky form and make it into small pieces. It is also possible to not include the chocolate into the mix with the other ingredients and instead dip the small fat bombs into chocolate. It will make them look better but not do any difference in taste. Once everything is done put the fat bombs into the fridge for around 30 minutes. You can either keep them here in the freezer or store them in a cool place. Remember that the major part of the fat bombs is made from butter which melts at room temperature so make sure you keep them cool. 34 Responses to "Fat bombs"
I saw “Fat Bomb” and totally thought of something else…. I’m glad you enjoyed and shared my Fat Bombs! Melt all the ingredients and mix them together. Pour into small cake forms and put in the freezer. what is your fat bomb recipe called? Do you have any hints for nut allergic people? Can I just substitute the almond butter for regular butter? I am also allergic to nuts, I use coconut butter instead. Can get quite heavy on the taste sometimes but try it out. Perhaps try sunflower seed butter. Look for unsweetened though.. that’s hard to find.. you can make it yourself though.. pretty easy! I am gonna make these over the course of the weekend. I was trying to figure out how to have a sweet treat without derailing the KETO plan—thanks! Pardon the sensitive question..does anyone have trouble with diarrhea after consuming these? If just starting out with keto you might experience this. Should settle after 1-2 weeks. It’s the coconut oil. It’s killing off yeast in your digestive track. It will even out. Any nutritional info for a single serving? Can I use just coconut oil instead of using part coconut oil, part butter? These recipes sound wonderful, but on our low-carb eating, we are also on calorie budgets. Can you share the calories in each of these Fat Bombs? How many of these can you eat a day? Depends…I just made some today because I was having trouble getting my macros right. I ate three of them. They are just like eating chocolate candy. I didn’t use butter. Was following the first recipe I looked up. 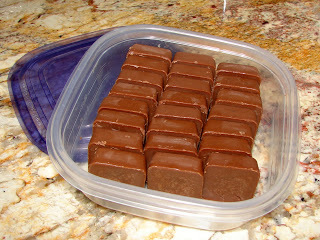 3/4 melted coconut oil, 1/4 cup coconut shreds, 3 tablespoons cocoa, a little stevia. put into silicone ice cube trays about 2/3 full and it made 9. MyfitnessPal app is what I use to see the macros. what is the portion size? there are so many fat bomb recipes and I haven’t seen one that gives you an indicator on what size they should be. I’ve told by some Wheat Belly followers that 2 Tablespoons but honestly they are huge and just seem too big…am I wrong? the images here look like the size of 1 Tablespoon maybe. As all recipes are different and probably make different size batches it would be great if someone could state the weight or spoon measurement appropriate per fat bomb. thanks! I used silicon ice cube trays and filled them about 2/3 full. I’d say it was maybe 2 good tablespoons in each. I don’t at the moment have ingredients for these, but um, if they are as you suggest, you should kickstarter / indiegogo these, especially if you think that low carb diets are going to take off. Again as unsolicited advice, you don’t even have to make them yourself. If you look at the company making soylent, they don’t make that themselves, they contract it out to qualified manufacturers already setup with certified kitchens. Because I would buy fatbombs — I’d love to see them at Costco. Can Peanut Butter be used instead of almond butter? Can use any nut butter you like. We have nut allergies. I substitute peanut butter with WOW Butter. Its made with non-GMO soy and it tastes exactly like peanuts. We love it and its 4 net carbs per tablespoon which is pretty low if you are only using a tablespoon or 2 for a larger recipe. These are delicious and just what I need to up my fat consumption while also satisfying my sweet tooth. I went ahead and made them before I read all the way through to the bottom. I’m not sure why you specify not to melt the butter and coconut oil but I did and it sure made it easy. Unless there is a very compelling reason against doing that, I would do it every time. I poured the thick liquid into ice cube trays, stuck them in the freezer for about half an hour….and they’re great. Also, I thought that 60 drops of stevia sounded like an awful lot so I used thirty then tasted….still needed a tad more sweetness so I added 10 more. For my taste level, 40 was perfect. Thanks for the recipe! Do you know the nutritional info of these? (How many carbs per serving, etc.) Thanks!